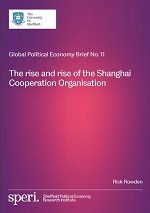 We are very pleased to publish a new SPERI Global Political Economy Brief on ‘The rise and rise of the Shanghai Cooperation Organisation‘. The Brief charts the development of the Shanghai Cooperation Organisation (SCO) and assesses how Russia and China have come together to cooperate on common geostrategic and geoeconomic goals for the long-term economic integration of Asia. The rise of the SCO is symbolic of deeper underlying trend in which Asian regional powers are increasingly asserting ever greater economic and political control over the Asian mainland by establishing new international organisations that bypass the major Western led organisations that have dominated international politics since the mid- 20th Century. Their deepening economic integration and their stepped-up military cooperation suggest that tectonic shifts are underway in global geopolitics and that, in terms of relative power, the historic political and economic influence of the US is likely to be diminished. Part I of the Brief discusses the origins of the SCO, including its military and economic goals. Part II discusses the China-Russia relationship, which served as the fulcrum for the establishment of the SCO. Part III discusses the recent expansion of the SCO to include both India and Pakistan and considers the likelihood of Iran and Turkey joining in the future. The Brief is available to download here. It is is the eleventh publication in our Global Political Economy Brief series.